Every Easter season I walk through the stores looking for interesting candies to give to my children. The aisles are always filled with novelties, always brimming with large chocolate rabbits, covered with brightly colored tin foil. I quickly learned that virtually all of the gaily colored rabbits were little more than large hollow shells of thin chocolate, cleverly crafted to appear luxurious and over-the-top. The expectation of abundance and plenty evaporates with the first bite, however, as the whole structure instantly disintegrates into a handful of dime-thin fragments. On the other hand, every store is also filled with tiny rabbits, made of the finest Belgian chocolate. Each delicious rabbit is so dense that you have to gnaw at it just to get a piece to break off. Every rabbit tastes of luxurious quality, carefully crafted to insure pleasure. Unfortunately, each and every rabbit is also tiny. All that changed a number of years ago when I walked into a candy store I had never seen before. There, at the rear of the store, stood a four foot tall, seventy pound, solid chocolate rabbit. I stopped and stared, scarcely believing what I was seeing. It was huge and expertly crafted, but without foil or any other adornment. As I paid for the rather expensive rabbit, the sense of abundance and excitement was overwhelming. Having given it to my children, we found that the rabbit was so dense it was almost impossible to cut, even with the sharpest knives. We had to gnaw on every little piece we were able to break off, just to get a delicious mouthful. In fact, after seven years, we still have pieces of that rabbit in our freezer, as does my mother-in-law, who was given a fair share of it. Christianity can often be like those large, gaily colored rabbits; offering far more than it delivers. While the scriptures speak of being born again, of being filled with all the fulness of God and of receiving more than we can imagine, real Christian life can seem to be a mockery of these scriptures. Believers, at times, seem to be drifting through life, their prayers unable to influence much of anything. Christianity has typically hollowed out the heart of the gospel. Many Christians have little interest in the Tannakh and act as if the Bible starts with the gospel of Matthew. There is little context or depth. These believers have sadly transformed the New Testament into spiritual Cliff Notes. On the other hand, in Judaism one can find treasures that have endured for thousands of years. The living covenant of Abraham stands as a solid foundation that has given hope to every generation of God’s people. The Jewish world view that recognizes the LORD’S hand in every area of human life gives sanctity and meaning to all that we do. This Jewish view of reality is not a wispy Greek universe of abstract ideas and theoretical knowledge, but ancient wisdom based on the solid rock of experience with the Word of a Living God who created and loves things human. He is not calling for His people to leave their own humanity behind and strive to become disembodied spirits without passion, desire and pleasure. For the Jew, Yahweh is a person you live with, whether you like Him or not. He is not your God because you happen to agree with him. In Judaism, theology is not what you believe about God but what you do with the God you believe in. He is a person you can sink your teeth into. We are free to wrestle with God, argue with Him and be ourselves with Him at all times. His truths are not glib and easily accessible but deep and inscrutable, nuggets of gold that have to be dug from the living words of ancient Jewish prophets. Jews walk with God, whether in joy or sorrow, pleasure or pain. He is responsible for everything and there is no god besides Him. Unfortunately, a big piece is missing. Most Jews do not believe that we have been given Messiah. Indeed, while Judaism is solid, rich and sweet, It is but a portion of what God has to offer. For believers who embrace a Jewish world view, the scriptures leap to life, with New Testament ideas deeply enmeshed in ancient prophesy and brimming with truth. Salvation is not a contract with God but a deep knowledge of Yahweh, the Father, and His Son. Prayer is no longer like dropping a dollar into a slot machine and hoping for the best, nor is it like wrangling a business deal with your banker. It becomes an intimate plea to the closest of lovers. With the Jewish Messiah comes a Jewish world view. 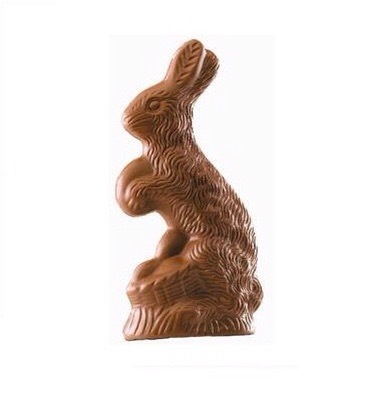 The hollow chocolate rabbit becomes solid, rich, and sweet; seventy pounds of excellence that never seems to end.